Your readership is so sophisticated. Not a single crack about splinters. I agree with you about subdued, modern and original. However, their website is something out of the Middle Ages. No thumbnails. In order to see Abby, All, Ant, Dave, Dot… or even find out what sorts of products they are, you have to download entire pdf documents. I can't imagine who has the endurance to find out about Neil, Nextstep, Stan, Up, and Wait. Wait. I skipped to that one. It's a chair. 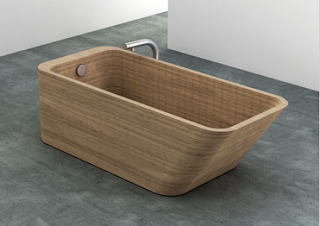 @ details and Design: This tub is made from a marine-grade wood, so hopefully it wouldn't wear too badly too quickly. @ Evan Jones: I share your frustration with the catalog downloads. This practice is now epidemic, and I feel it places an unfair burden on visitors to sites.